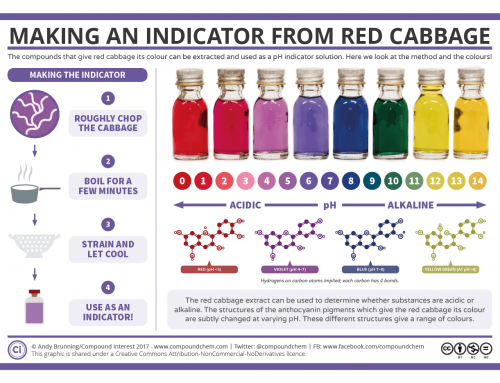 What Causes the Colour of Gemstones? There are a wide range of gemstones used in jewellery, with each having its own characteristic colour – or, in some cases, a range of colours. The origin of these colours has a chemical basis, and the precise colour can vary depending on the chemical composition of the gemstone. Interestingly, many minerals are actually colourless in their pure form, and it is the inclusion of impurities in their structure which leads to their colouration. Generally speaking, we observe an object as coloured when it absorbs some wavelengths of visible light, but not others. Different colours of light have different wavelengths, so the exact wavelengths that are absorbed will affect the colour that the object appears. For example, an object that absorbs all wavelengths of visible light that pass through it, but does not absorb red light, will appear red. Why does this absorption of light occur in the first place? This is dependent on the elements present in the structure of the gemstone. Some elements don’t lead to the absorption of visible light – for example, compounds containing metals from group 1 in the Periodic Table are commonly colourless. 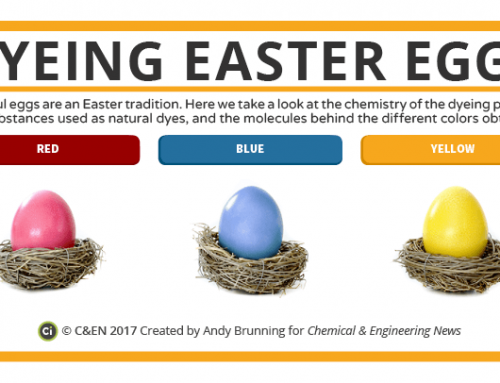 Conversely, the transition metals (the large group of metals in the centre of the Periodic Table) are capable of absorbing coloured light. Transition metals have this capability because they have electrons in d orbitals. Orbitals are essentially regions of space around an atom in which electrons can be found; they can have different shapes and energy levels. The d orbitals in transition elements are partially filled, and this mean the unpaired electrons therein are capable of absorbing visible light in order to promote the electrons to a higher energy level. When they do this, the wavelength of light they absorb is removed from the light completely. They later fall back down from this ‘excited state’ releasing the excess energy as heat. 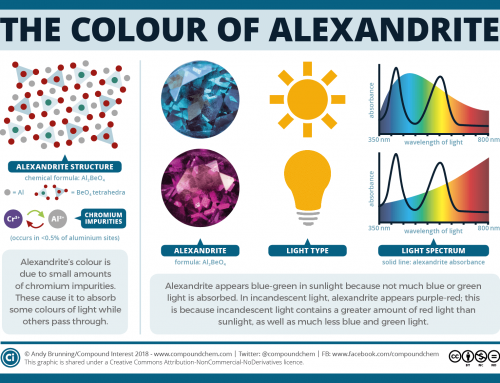 Different transition metals are capable of absorbing different wavelengths of visible light, thus giving the wide range of colours seen in gemstones. 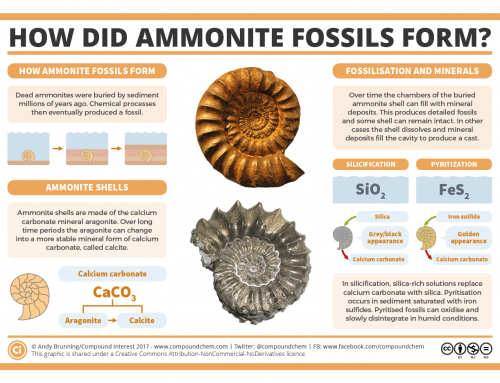 The transition metals may be part of the chemical formula of the mineral, or they may be present in the mineral as impurities. Even small amounts of these transition metal impurities, where a transition metal atom sits in the place of another atom which would usually occupy that position in the structure, can lead to an intense colouration. The origin of colour in gemstones is not always down to the presence of transition metals, however. The transfer of electrons between ions in a gemstone’s structure, as a result of the absorption of wavelengths of visible light, can also be responsible in some cases. In sapphires, this is the case, with the colour a result of charge transfer between iron 2+ ions and titanium 4+ ions. The absence of an ion in a specific location in the structure, or the presence of a foreign non-transition metal ion, can also lead to colouration, as can simple diffraction of light through the crystal’s structure. There are also examples of variations of colour within the same gemstone. The prime example of this is alexandrite. Alexandrite appears green in daylight, but red in incandescent light. This is due to the fact that natural light is richer in green light, to which our eyes are more sensitive, so we perceive the gem as green. Incandescent light, on the other hand, is richer in red light, leading to more red light being reflected, and our eyes perceiving the gem as red. 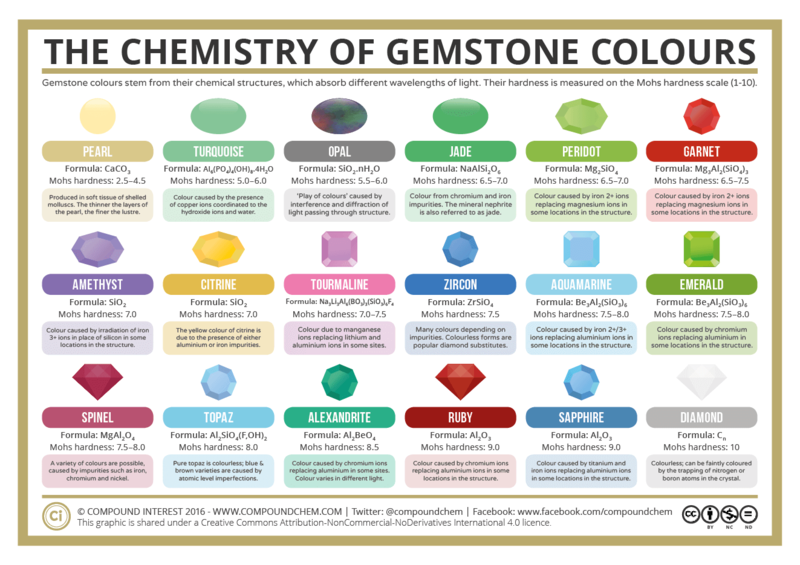 If this has piqued your interest and you’d like to read into the subject in a little more detail, I’ve included some interesting links with more complex explanations of the source of colour in gemstones below. Many of the gemstones included in the chart can be found in a wide range of colours; for example, garnets, although commonly the well-known red colour, can also be found in many other varieties. 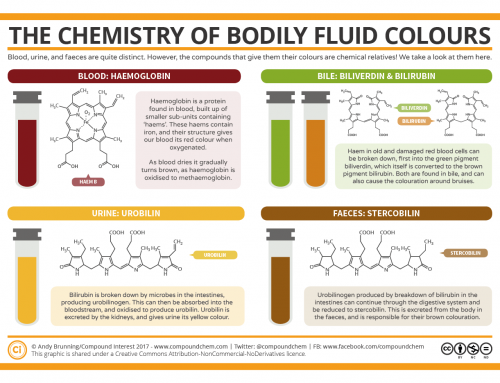 There are also several other causes of colour, rather than the main causes detailed here, so it’s a very varied area of chemistry!